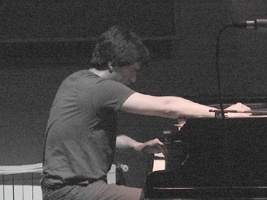 Gabriel Paiuk is a composer, pianist and improviser born in 1975 in Buenos Aires. As a composer Gabriel Paiuk works within the exploration of conventional instruments, extended techniques as well as with electronics, focusing on concrete sounds and the exploration and co-existence of different electronic and acoustic “registers.” As a pianist he is particularly focused on improvisation, performing regularly in Buenos Aires since 2000, with other concerts in Berlin, Brussels, Barcelona, London, Paris, Amsterdam, Lisbon, Fresnes-en-Woevre and New York.In 2004 the Kammerensemble Neue Musik Berlin premiered an ensemble piece at the Berlin-Buenos Aires Metropolenprojekt 2004 at the Podewil, Berlin. In 2003 he was composer in residence at the CETC (Experimental Centre of the Colon Theatre, Buenos Aires) at the ‘Instantaneas’ project and has presented pieces at the British Arts Centre, Centro Cultural Ricardo Rojas, Museo de Arte Moderno de Buenos Aires and Experimenta 2000 Festival. He has taken part in groups devoted to free improvisation performing regularly in Buenos Aires, Europe and USA, together with Andrea Neumann, Jason Kahn, Axel Dörner, Burkhard Beins, Rhodri Davies, Matt Davis, Ricardo Arias, Lucio Capece, No Spaghetti Edition, Robin Hayward, Julia Eckhardt, Sean Meehan, John Russell, Sergio Merce, Manuel Mota and Ernesto Rodrigues. He took part in Keith Rowe’ s Electroacoustic Ensemble. The project, coordinated by Keith Rowe and organised by the Belgian ensemble Q-O2, focused on the performance of Cornelius Cardew' s graphic piece ‘Treatise’. He is an stable composer of the “La Otra” dance company since 2001.